On presentation, Black Bear #19-0328 was quiet but alert and responsive. The male bear was very thin and poorly conditioned, weighing only 10 kg. A physical examination revealed severe alopecia [hair loss] on the bear's face, crusty skin on his body (most notably on his flanks), and matted hair along his abdomen. These are all symptoms of mange in Black Bears, so a skin scrape was performed; the test confirmed that the bear was suffering from sarcoptic mange. The patient was anesthetized for radiographs, which revealed a severe pneumothorax -- a condition where there is air in the thorax [chest] outside of the lungs. This results in difficulty expanding the lungs to breathe. The remainder of the radiographs were within normal limits for a thin yearling bear. A thoracocentesis was performed to resolve the pneumothorax; this is a procedure where a small needle is placed into the chest cavity, and the free air is suctioned off. When clipping the hair for the procedure, a tiny puncture wound was noted on the left side of the bear’s chest, which is thought to be the source of the free air in the thorax. There was a very small piece of metal removed from the puncture – a jagged piece of fence or wire – and it's possible that this punctured the bear’s chest wall. After the free air was removed, the small puncture was sealed with a bandage to prevent further air from freely entering the thorax. Initial blood work showed the bear was mildly anemic. The bear was given fluids and set up in the Center’s isolation room, where he will likely remain until all the yearlings currently housed in the Large Mammal complex have been released. Although the bear did not display significant respiratory distress during the initial examination, the veterinary team will monitor his respiratory rate and effort for several days due to the pneumothorax. 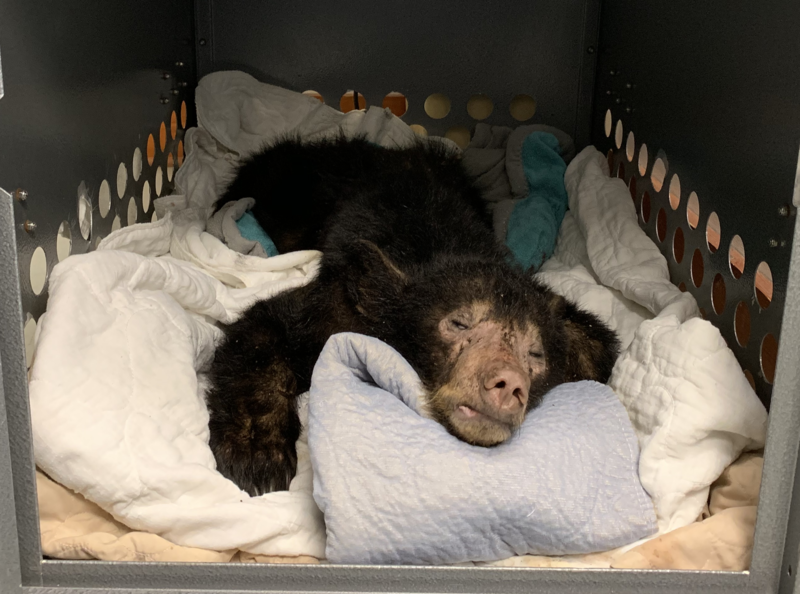 The bear will be given an anti-parasitic medication to treat the sarcoptic mange, and, as long as he doesn’t need antibiotics for other underlying issues, he’ll likely participate in a mange treatment study coordinated by the Center’s veterinary fellow Dr. Peach. Due to severe mange and a pneumothorax, the prognosis for Black Bear #19-0328 is guarded. Your donation will help support this Black Bear ... and the other 3,000 patients the Center is treating this year. Thank you! On April 23, the veterinary team will perform a skin scraping to re-check the presence of mange mites; this will be two weeks after the bear’s treatment started. In the next week, the staff will move the bear from the Center’s isolation room to the Bear Pen, after Black Bear #18-2926 moves to the Large Mammal Isolation enclosure.